Who remembers the joys of the Cold War, when every day could be the day they drop the bomb? With This is Only A Test Eagle-Gryphon Games takes you back to those carefree days. Imagine it’s the 1950s again, and the air raid siren just came on. It could mean three things: either the bomb is about to drop, or Soviet soldiers are about to march into your back yard… or it could be only a test. For each scenario you want to stockpile different things. Consumables if they nuke dropped, self-defense items if the Russians came, or luxury items if it was a test. You decide what to hoard, but in This is Only a Test you also control which scenario will occur in the end, and with it which win condition you will have. Problem is, your neighbors are trying the same. Big guys beating up opponents is good for some houses in KeyForge. Not for House Shadow. Their specialties are stealth, speed, and dirty tricks. Booby traps, protective specters and clever thieves that return to your hand instead of being destroyed, all part of House Shadow’s shady arsenal. Ever since Dominant Species I keep an eye on new GMT Games releases for heavy, strategic games that aren’t wargames. There’s no political message there, just my personal taste. I get all the happier when they make a new non-wargame. Like SpaceCorp. And that is a big game. SpaceCorp lets you play through three eras of space exploration, each with its own game board. The era of Mariners is about exploring everything out to Mars. In the era of Planeteers you settle the rest of the solar system. Finally, in the era of Starfarers, you leave Sol behind completely and set out to new stars. 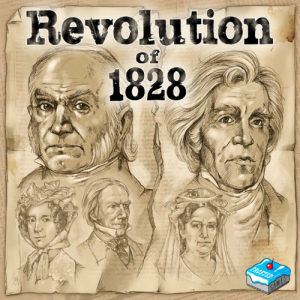 A short game just takes you through one era, but you can play a long game through all eras in about three hours. Whoever made the most profit along the way wins. Announcing the first expansion before the base game is even released seems weird to me. But I make an exception if the expansion increased the number of players. It keeps the game more affordable for most people who’ll only play with up to four, but at the same time it gives the option to play with more players. Gen7: The Breaking Point is one of those expansions, it let’s you play the second Crossroads game with up to six people. Of course that’s not all it does. The Breaking Point also has a new scenario that turns the cooperative Gen7 into a competitive game. Uwe Rosenberg became famous with big, heavy games like Agricola. However, his lighter games like Patchwork and Indian Summer are just as good. The latest Rosenberg is even a bit lighter. 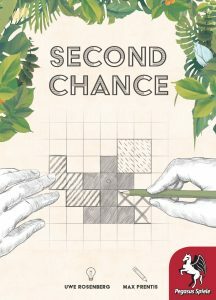 Second Chance is a “draw and draw” game: You draw a card, and then all players draw the vaguely Tetris-like puzzle tile into their player sheet. After a couple of rounds someone won’t be able to fit the tile into their sheet, but that’s not the end. They get a second chance, a new card only for them. If they can fit that one, they keep playing. If not, then they’re out. The player with the fewest open spaces wins. Like I said, it’s a Rosenberg ultralight edition, but it has enough going on to keep it fun. Subtext is a communication/drawing game by this year’s most prolific author Wolfgang Warsch. The active player draws a word card, remembers the word, then shuffles the card with enough other cards to give one to each player. One other player now has his word, the others have random words of their own. Now all players, including the dealer, draw a hint for their word. They want to be specific enough that the other player in the know recognizes it, but none of the other players do. It’s another simple game, but it’s just my kind of mind-bending. Pushing vagueness to the limit, mixed with my hilariously bad drawing skills, will make for some entertaining hours.